and most vital business values to possess. CUPERTINO, CA (PR Buzz) – March 28, 2019 – – Sales and marketing may appear to be the same entities, but these two business elements cover different aspects that should be put in correct balance. While the sales process happens at the frontline of the business, it is important that this aligns with the rest of the business processes, such as marketing, product development, production, and operations support. Thus, streamlining business functions is essential. However, doing this will ultimately require the establishment of a competent sales team. Diane Updyke, an advisor for the Software as a Service (SaaS) method and a reputable management consultant, put together significant insights about effectively executing every part of the business through sales team motivation and teamwork. In this book, "Building Your Sales Team," Diane has laid down vital business values that every person in the business needs to learn. 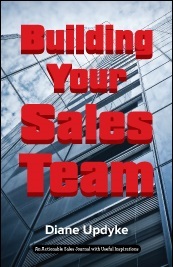 The 140 AHAmessages™ from "Building Your Sales Team" will surely improve the way you perceive everyone who is involved in the business, be it your salespeople, customers, or business partners, and thus build an effective and successful sales team. "There is no doubt that Diane Updyke was able to dig deep into understanding the intricacy of business processes through her book, 'Building Your Sales Team.' She provided enlightenment about achieving harmonized sales and marketing efforts to succeed in building up the team in the business," says Mitchell Levy (http://aha.pub/MitchellLevy), Global Credibility Expert and The AHA Guy at AHAthat® (https://AHAthat.com). Sales execs want you to sell value, but to sell value, you need to know the customer's problem; to know the problem, they have to trust you, and to earn value, you have to build a relationship. It all starts with relationships. —Paul Teshima (CEO of Nudge.ai) via http://aha.pub/DianeUpdyke. While managers are there to offer strategy and guidance, don't rob your team of the ability to learn from mistakes. It's okay to learn. http://aha.pub/DianeUpdyke. We are 31% more productive when we are in a positive mindset. Look for people who are motivated by positivity, they will absolutely produce more! —Joe Hubbard (Director of Trainings at Thrive Global) via http://aha.pub/DianeUpdyke. Greater sales effectiveness comes from sales ops (getting more out of your systems), sales enablement (getting more out of your people), and culture (getting more out of communications). http://aha.pub/DianeUpdyke. Training is learning WHAT to do, Practice is learning HOW to own it, and Culture will make the team WANT to keep at it. http://aha.pub/DianeUpdyke. Read and share AHAmessages in this AHAbook on Twitter, LinkedIn, and Facebook by going to http://aha.pub/BuildingYourSalesTeam.